Hendrickson is the leading innovator and manufacturer of suspension systems and components for the global heavy-duty vehicle industry. They approached CEI because they knew we had the best internal resources, from our Account and Project Management teams to our metal shop, to handle a project like this. 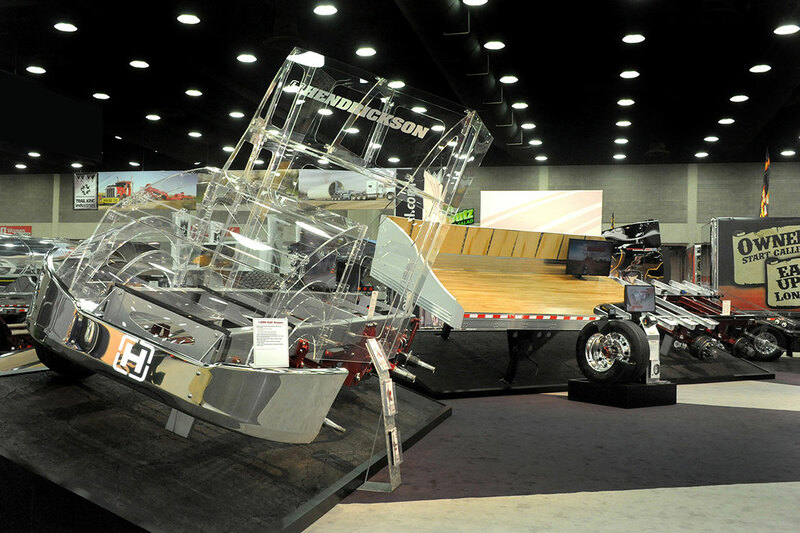 Hendrickson wanted to showcase their truck and trailer axles on a full size 53′ semi-truck display in their exhibit. They needed an innovative way for their sales staff to communicate with show attendees about their products, which reside under the tractor and trailer. At the start of the project, our Design and Account teams met with Hendrickson to understand their challenges and goals. We spent quite a bit of time on R&D to overcome some concerns we identified. Incorporating the actual wooden floor planks and side walls of a trailer added weight to the display and we had to accommodate for those in the overall design. The goal of this project was to get attendees’ attention and draw them into the exhibit where Hendrickson’s sales staff could further discuss their products. 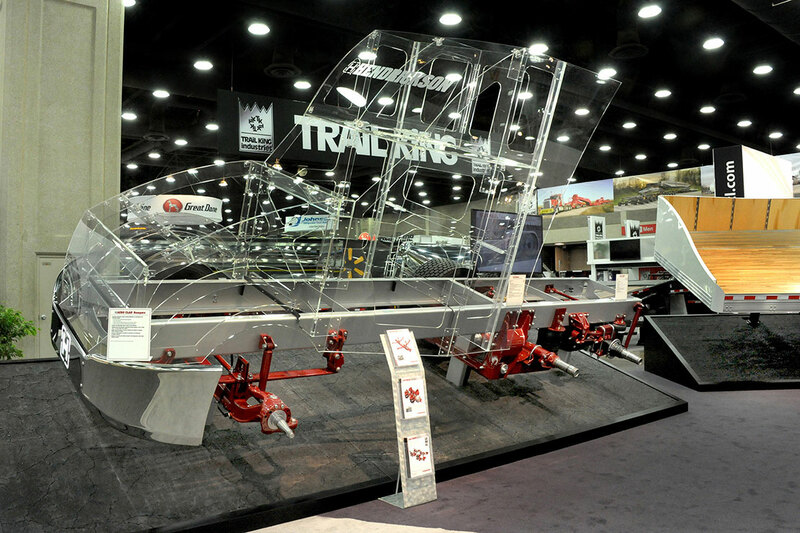 Our solution was to create a design that allowed for a modular 53′ semi-truck trailer to be set up at trade shows in Hendrickson’s booth. The axles were prepped and painted to “show ready” condition in our automotive paint shop. 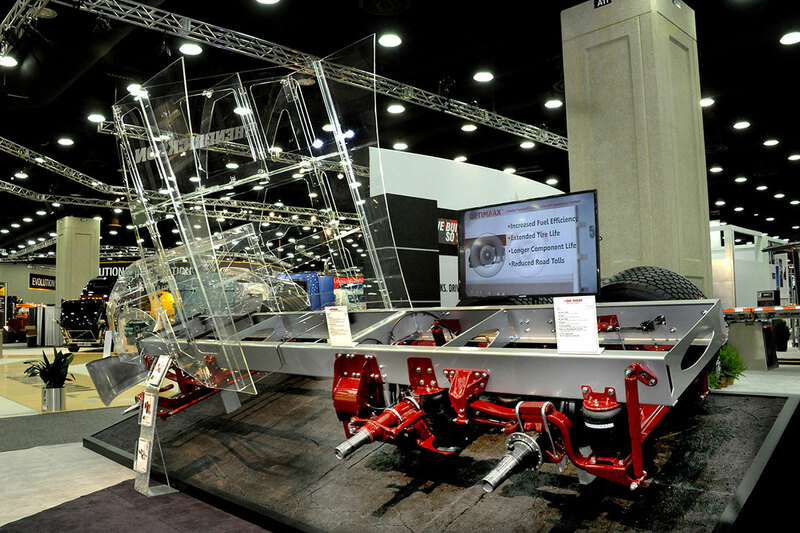 On the show floor, we assembled the truck cab and trailer around the axles utilizing actual parts from a trailer. 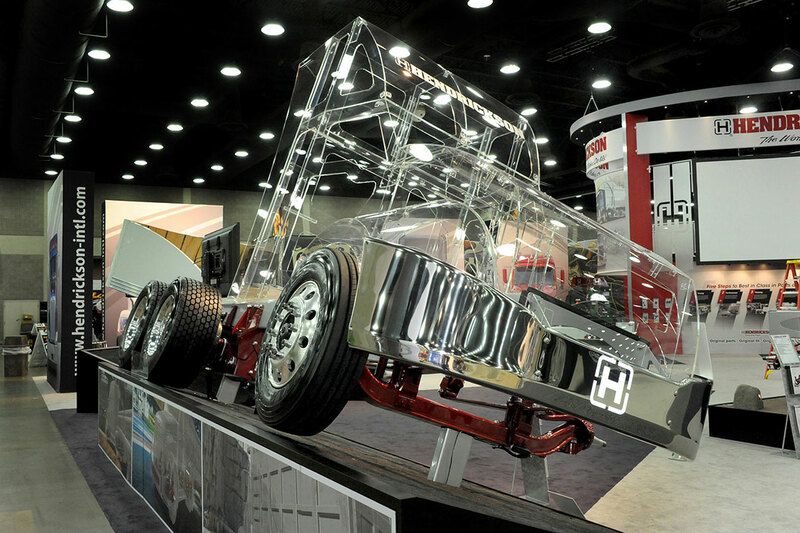 We constructed the cab from acrylic, which allowed attendees to see Hendrickson’s product while also improving sight lines within the exhibit. 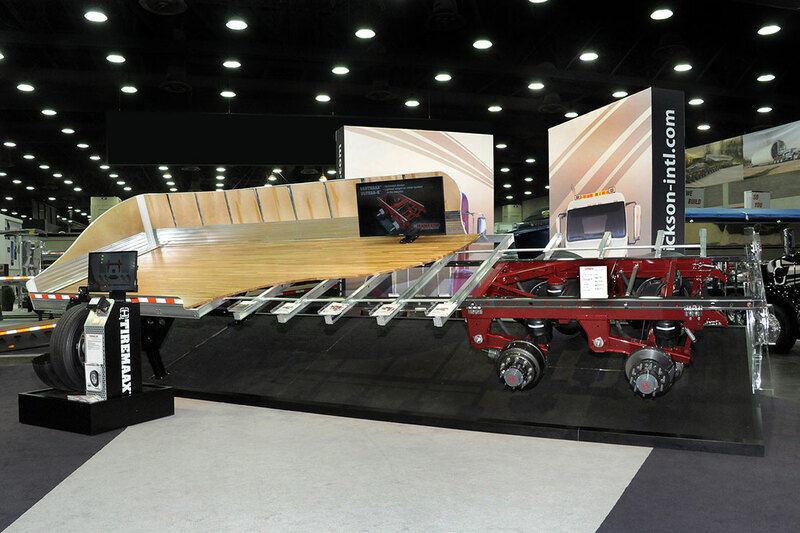 Both the truck and trailer were built at an angle to allow customers to view the axles easier. 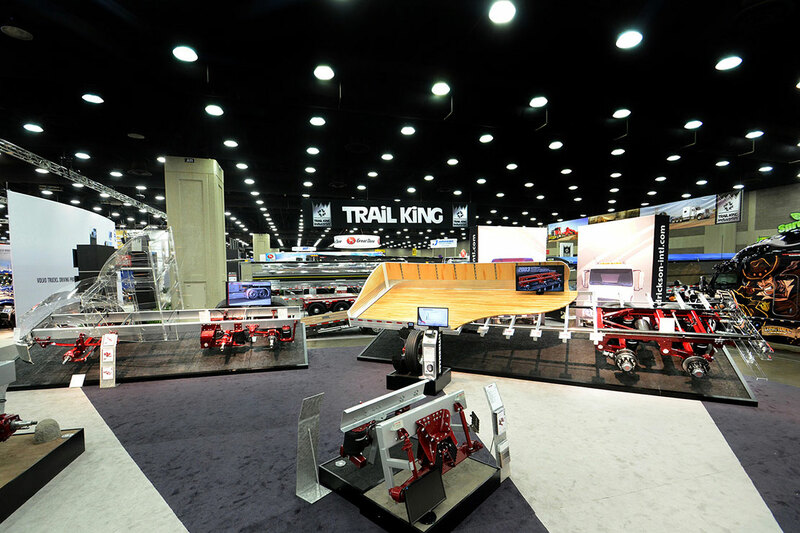 The result was a unique display that attracted attendees while providing the customer a realistic view of Hendrickson’s products in scale on a 53′ semi-truck display in their exhibit. Incorporating wooden floor planks and side walls of a trailer added weight to the display and created some complexities our team needed to overcome, but the final effect added to the appeal of the project. By displaying it at an angle and without tires on both sides, we were able to provide easy access for Hendrickson’s sales staff to engage attendees while showcasing their products.